In 1840, the Oregon Trail was the primary emigration route across the northern part of the United States. Two decades later, when gold was discovered west of here, a trail called the Corrine Road was used to bring supplies north from Salt Lake City to Bannack and Virginia City. 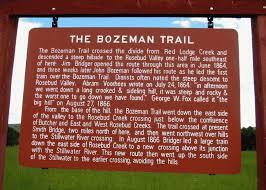 John Bozeman, determined to shorten the time and distance to the gold strikes, scouted another route, departing from the Oregon Trail at the North Platte River. 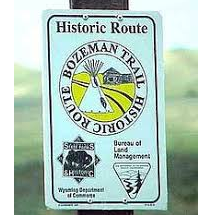 The Bozeman Trail, or Montana Cutoff, crossed here and can be seen on the opposite hillside. This trail was used from 1863 to 1868. Sioux Indians frequently attacked the wagons and freight trains as they crossed the eastern leg of the trail. Consequently, Fort Reno, Fort Phil Kearney and Fort C. E. Smith were established to protect travelers but were also the target of Indian attacks.